Kern race fans rejoice. The Kern County Raceway is almost here, and it promises to be fast. Fans will have to wait a little longer, though. Partners at Raceway Development, LLC have elected to postpone the scheduled April 20 opener to Saturday night, May 4, with the NASCAR Whelen All-American Series. Construction is nearly complete on the state-of-the-art half-mile and quarter-mile speedways set on 120 acres near Interstate 5 and Enos Lane in Bakersfield. 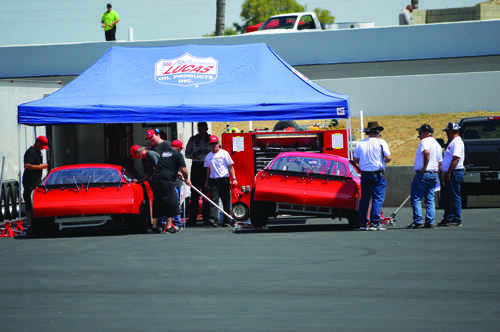 The huge undertaking will be unveiled to the racing world on May 4, bringing the NASCAR Whelen All-American Series back to Bakersfield for the first time since 2003.The new track has a fully stocked garage, with two tire-changing stations and three stations for engine repair. It will also cater to fans with 18 concession stands. The track also has 24 suites on the top two floors. The suites hold 25 people apiece. The garage also allows race officials to check the winning car after a race to make sure the team isn’t “pushing the edge” by cheating. The building is mirrored, identical on both sides. It also has an on-site grounds keeper and all the metal work for the construction is done on site. The track, at a bit over a half-mile, promises to be faster than Mesa Marin. The track is also completely banked, 14 degrees in the turns and eight degrees in the straightaways. These assessments were confirmed once practices runs started. Lap times for the racers were between 17-22 seconds.